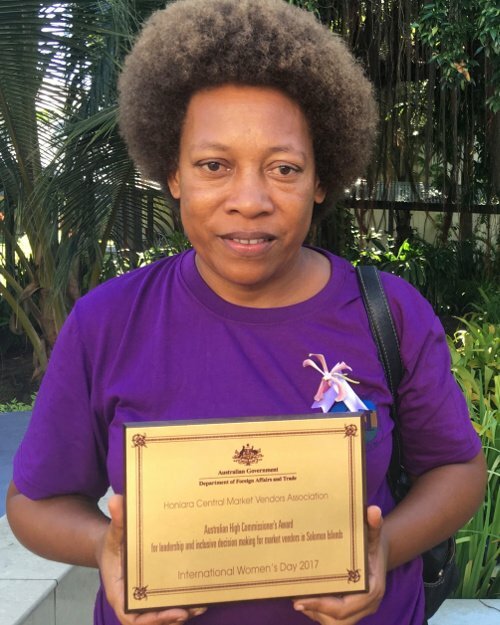 Since being elected president of the Honiara Central Market Vendors Association (HCMVA in 2016, Maureen Sariki has dug deep to lead, and create camaraderie in the market place. The Honiara Central Market Vendors Association is a key partner in numerous initiatives, from social to diplomatic to scientific. A member of the executive committee since 2014, Maureen focused immediately on strengthening relationships with market management, which resulted in the local government demonstrating commitment to include women market vendors in the development of market budgets and plans. Maureen has also been winning the support of her 375-strong membership base (95% of whom are women) through various fundraising activities. Funds raised have been used to meet the needs of vendors such as supplying temporary shelter to keep produce and vendors out of the elements. 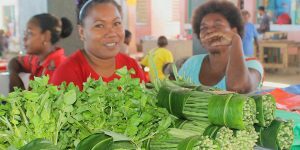 Her strong relationship with market management has ensured she is consulted during Honiara City Council Meetings and as a representative of the vendors is often called upon to assist and ensure the smooth running of the market. “My view is that the association acts as a collective voice for vendors issues in the market place and is a good governing body in which we look mainly at the rights of vendors and how they are treated in the market area because in the past many people saw market vendors as not important people in the country,” says Maureen. “Though people see market vendors as ordinary women, their contribution to the country in terms of revenue earned as well as the market fees contributed to the council is important,” she adds. “Addressing women’s issues in a male-dominated society can be a challenge. However, we’ve tried our best and worked hard to establish partnerships with men in order to address issues facing women,” says Maureen.